Are Crash Test Dummies Going Digital? Think of them as digital dummies. Or crash test avatars. They’re computational human body models, anatomically accurate computer figures built from MRI, CT and other medical scanning techniques to simulate how the body’s bones, organs and connective tissues react to external objects and forces. Over the past decade, these virtual manikins have become valuable tools in injury biomechanics, the multidisciplinary study of how injuries are caused and how they can be prevented or mitigated. Computational body models have not yet replaced mechanical human substitutes—crash test dummies—in assessing the protective properties of motor vehicles, military equipment and other products. With very few exceptions, physical crash tests are still required to meet regulatory requirements and rating standards. But computerized figures offer many advantages over dummies and are becoming more widely used in a variety of fields. Because they exist exclusively on computers, body models have an indefinite life span as opposed to mechanical dummies, which last about 10 years on average. And the cost of simulating a car crash or other event on a computer is minimal, whereas a physical test can cost around $30,000 USD. However, the research and development of an original computational model can be quite expensive, Gayzik said, which is why most of that work is funded by the auto industry and government. One of the most prominent sponsors is the Global Human Body Models Consortium (GHBMC), an international alliance of seven automakers and one supplier founded in 2006 to consolidate body modeling research and development into a unified effort to advance crash safety technology. 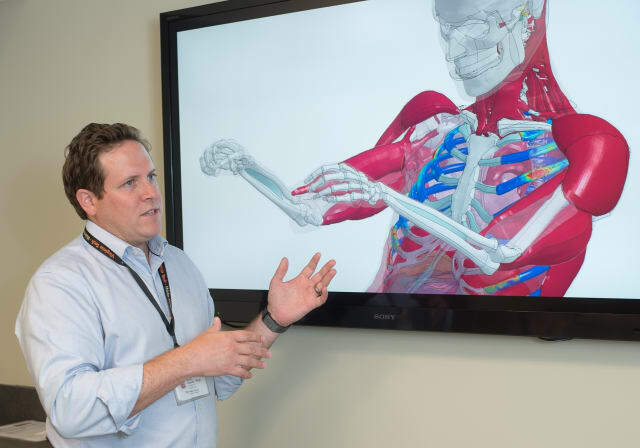 The Center for Injury Biomechanics at Wake Forest School of Medicine is the consortium’s integration center, with responsibilities that include collecting data from other sites, developing full-body models and testing their reliability. Gayzik and Joel Stitzel, chair of biomedical engineering at the School of Medicine, co-directed the team that in 2011 constructed the GHBMC’s first full-body model, of a mid-sized male seated vehicle occupant, in an effort that included researchers at institutions in the United States, Canada, France and South Korea. The GHBMC now has a “family” of 13 body models of male and female, adult and child vehicle occupants and pedestrians in detailed and simplified versions for use in simulations. These models can be licensed by academic and commercial users through Elemance, a Winston-Salem-based startup formed by Gayzik and Stitzel in conjunction with the GHBMC and Wake Forest Baptist. In addition to vehicle-related work, Gayzik and colleagues are engaged in two projects with the Defense Department and Army Research Lab. The first, being conducted solely at Wake Forest, is developing male and female models in different combat positions (such as aiming a rifle while on one knee) for use in simulations to understand soldier vulnerability in various scenarios and how personnel can be better protected. The second, being led by researchers at John Hopkins University, is developing a biofidelic warrior-representative injury assessment surrogate – that’s Army-speak for crash dummy – capable of predicting specific injury risk to vehicle occupants in live-fire tests, including vertical impacts from below. While involved in these efforts, Gayzik is looking ahead to working on the next generation of computational body models. He believes the models can be refined to be more flexible in terms of positioning, to better “capture” muscle tension (which, for example, is different in a person braced for a crash than in someone who is relaxed) and to more accurately represent specific populations (such as older adults and people with common conditions like obesity and osteoporosis). 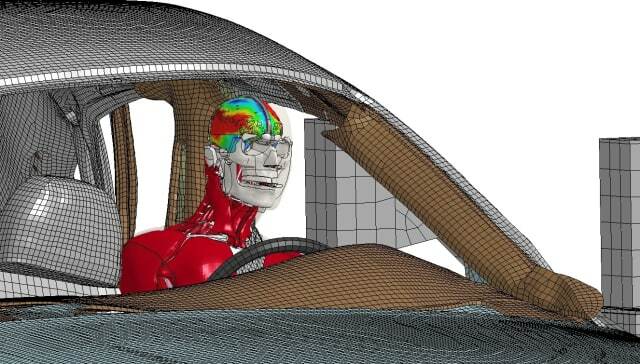 Gayzik also anticipates that simulations using body models will gain wider acceptance as valid tests of the effectiveness of safety systems. “I think some of the tests that currently use crash dummies will be done with computer models in the near future,” he said. For another example of how engineers are working to reduce injuries and save lives, find out how these engineers are Reducing Sports-Related Concussions One Tackle at a Time.